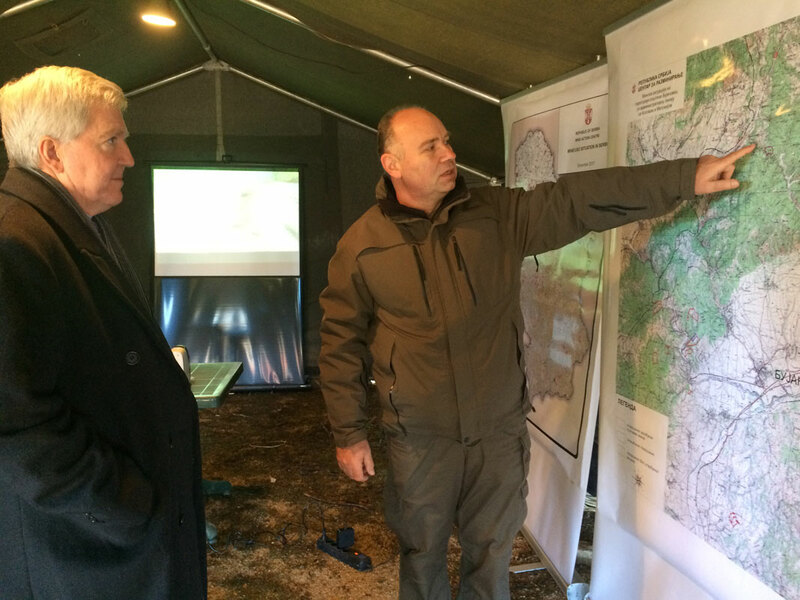 On 20 December 2017, clearance operations in accordance with the UXO clearance project of the “Ćuprija – 1” location were completed. 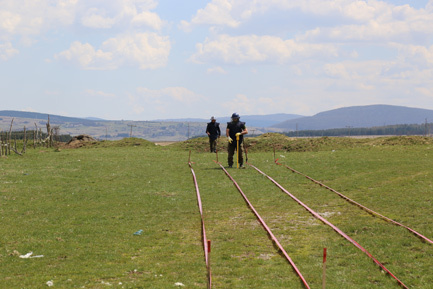 On this project developed by the Mine Action Center, which controlled quality of the works, clearance was conducted by the Russian state agency "Emercom”, namely, its specialized organization "Emercom Demining", which for ninth years in a row has been carrying out UXO clearance in the vicinity of the military depot in Paraćin, in which occurred a fire and explosion on 19 October 2006. The project area totaled 775.200 sqm, and 114 pieces of unexploded ordnance (UXO) were found and safely destroyed. 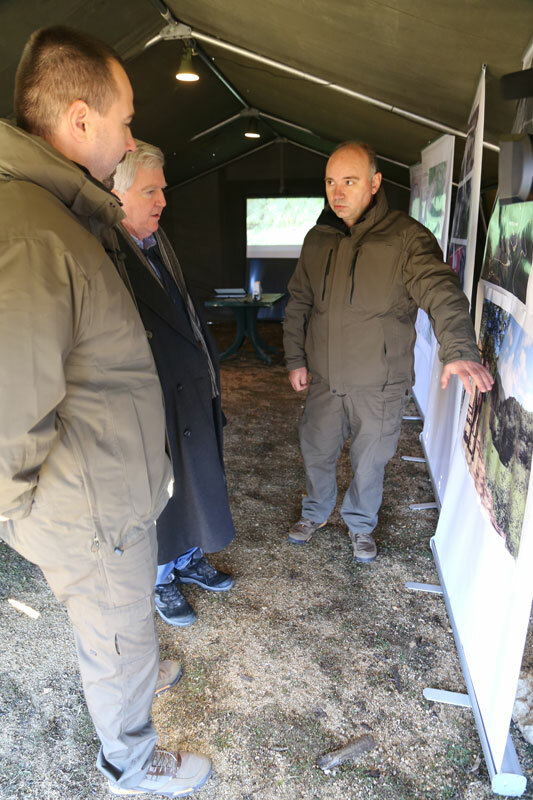 The project was funded by the Government of the Russian Federation within the assistance to the Republic of Serbia in UXO clearance of its territories and facilities. Since 2008, the Russian Federation has been providing assistance to the Republic of Serbia in the field of humanitarian demining. In addition to UXO clearance projects in Paraćin and Ćuprija, 11 locations, in the period 2009-2017, and cleared area of 5,380,060 m2, where 12,710 pieces of various kinds of UXO were found and destroyed, 4 cluster munitions clearance projects in Niš were completed in the period 2008-2014, where 741,379 m2 were cleared and 452 pieces of cluster munitions and other unexploded ordnance disposed. 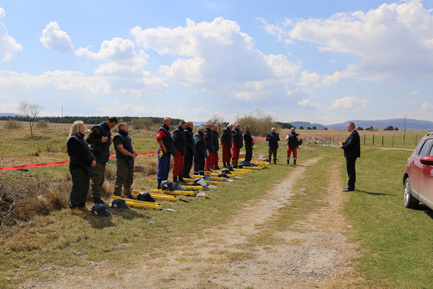 It is planned that in 2018, in accordance with the project of the Mine Action Centre, "Emercom demining" continues clearance of the area contaminated with various types of UXO and their remnants after a fire and explosion, which occurred in a military depot "Paraćinska utrine". The total area of the project in 2018 is 606,000 sqm, and the works will be carried out in the municipality of Ćuprija. 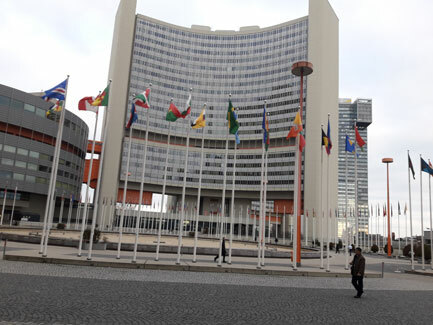 The 16th Meeting of the States Parties (16MSP) to the Convention on the Prohibition of the Use, Stockpiling, Production and Transfer of Antipersonnel Mines and on their Destruction took place in Vienna, Austria, from 18 to 21 December 2017. At this meeting, celebrating 20 years of the Ottawa Convention, States Parties and Non-States Parties, interested organizations and members of civil society had the opportunity to assess progress in implementing the commitments under the Convention, as regards mine clearance, stockpile destruction and victim assistance, and discuss how to achieve a common goal - a mine free world by 2025. The representatives of the Republic of Serbia presented the overall specificity of the mine situation in our country, given that we are not dealing with classical minefields, but groups of mines that were emplaced in no pattern, which in terms of time and necessary financial resources aggravate their removal. 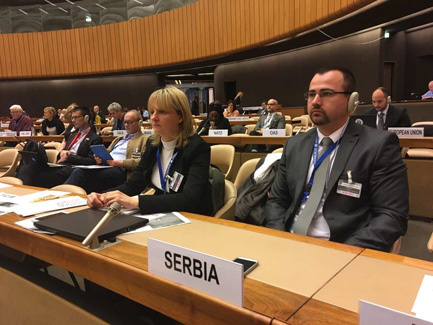 In addition, previous results were presented, as well as the challenges the Republic of Serbia is facing while striving to complete clearance of the remaining mined area within the granted five-year extended deadline (2019) in order to protect its population, but also aiming to increase global human security, thus showing full commitment of the Republic Serbia to this Convention. Furthermore, the efforts done by the Republic of Serbia in the victim assistance segment were also presented. On 7th December 2017, US Ambassador to Belgrade, H.E. 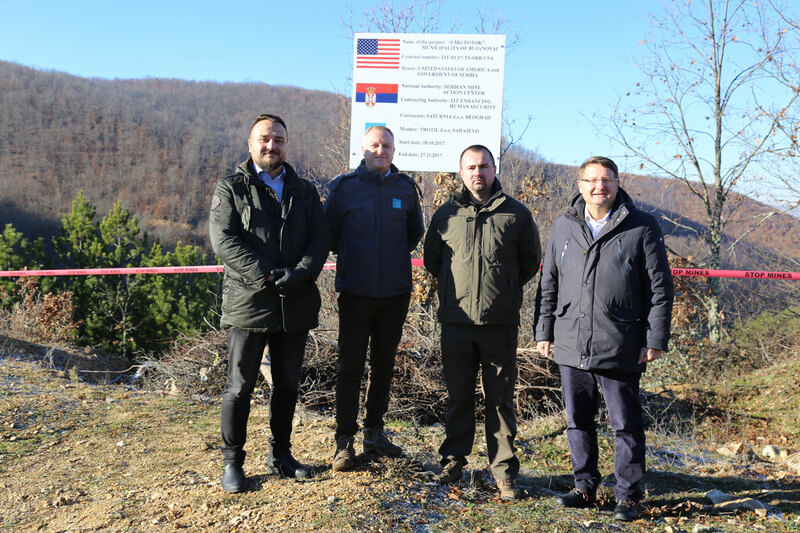 Mr. Kyle R. Scott and his associates visited the site of completed technical survey project of the "Uški potok" location in Bujanovac. 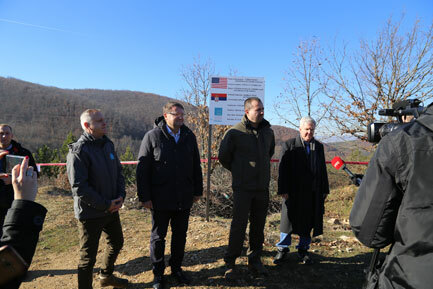 The Serbian Mine Action Center hosted the event where, in addition to the representatives of the US Embassy, the Director of ITF Enhancing Human Security with associates, representatives of the Municipality of Bujanovac, representatives of Ministry of Defense, the contractor and the monitor, were also present. 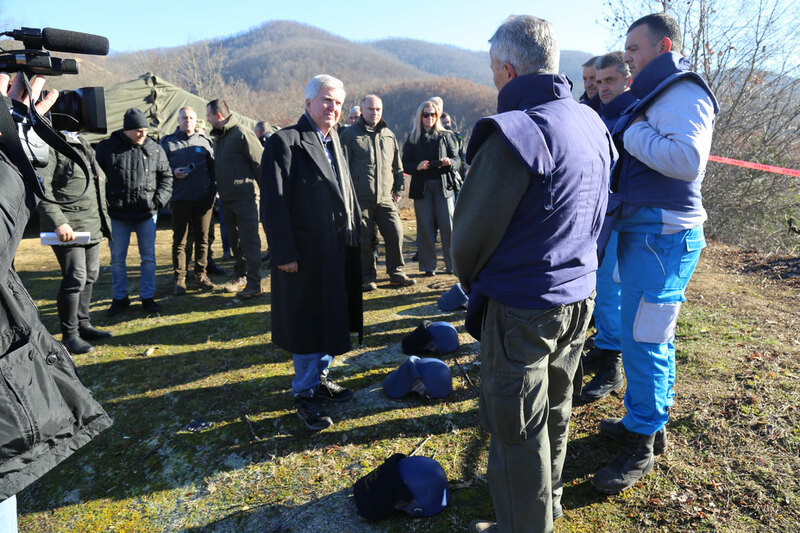 The implementation of this project was financed by the assets allocated by the Serbian Government for humanitarian demining operations in the municipality of Bujanovac, which were "matched", i.e. enlarged by the US Government donation through ITF Enhancing Human Security. 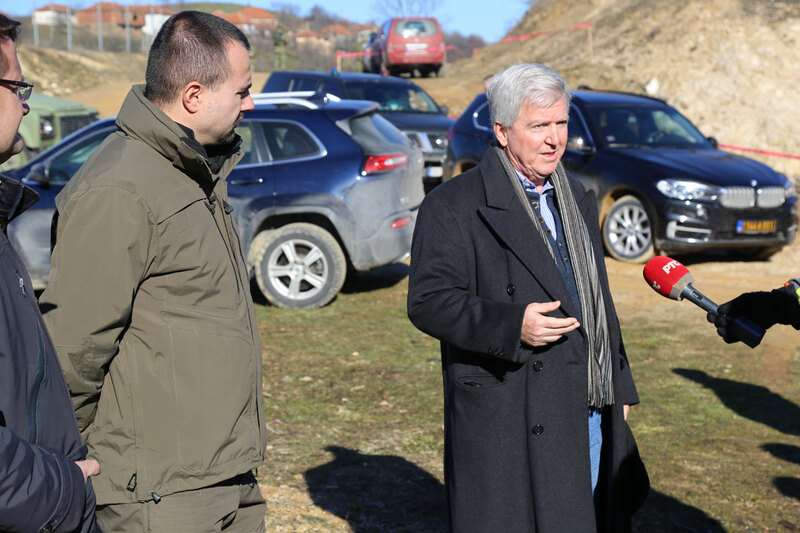 Ambassador Scott and the attendees had the opportunity to get acquainted with the overall mine situation in the Republic of Serbia, with a special emphasis on the results of the completed one, out of five technical survey projects, in the municipality of Bujanovac. 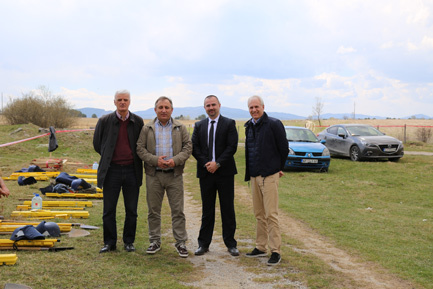 Among other things, on this occasion, the video shot with a drone was presented showing the work of the deminers on the "Uški potok" project, which aimed to demonstrate the complexity and severity of humanitarian demining operations, as well as the efforts of the SMAC to use the latest equipment and techniques, within its capabilities, in order to provide optimum conditions for the work of deminers and improve the outcome in demining. Given that in the territory of the municipality of Bujanovac there is still an area of 2.354.540 sqm suspected of being contaminated by groups of mines, on this occasion the plans for continuation of humanitarian demining operations in this municipality have been considered with expressed readiness for future support to the projects of the Serbian Mine Action Center. The commencement of works on another technical survey project in the municipality of Bujanovac was announced, at the "Ravno Bučje” location, which is also financed from the joint funds of the Government of Serbia and the US Government through ITF Enhancing Human Security. 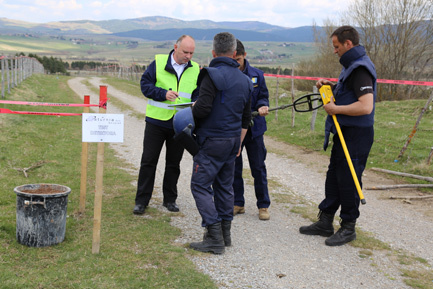 The site operations under the Cluster Munitions Clearance Project of the “Sjenica -Airport” Location, No. 0181/15, Municipality of Sjenica, area of 177.120 sqm completed on 20 May 2017. 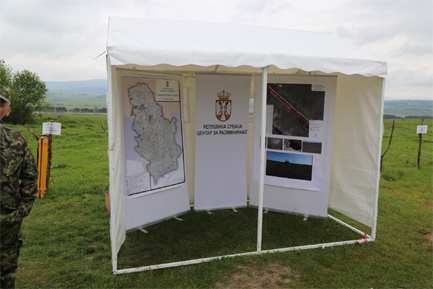 The project area included the civilian land nearby the military airport in Sjenica. During the implementation of the project 77 pieces of unexploded cluster munitions and other UXO, namely 76 pieces of cluster munitions BLU97A/B and 1 mortar mine were found and safely destroyed. After clearance of this site, danger that cluster munitions pose to locals will be eliminated and it will enable optimal cultivation of meadows, pastures and agricultural land. In the territory of the Republic of Serbia, cluster munitions contaminate the area of around 2,800,000 sqm, of which in the Sjenica Municipality, the area of around 1,200,00,sqm is contaminated. The Mine Action Centre has developed projects for clearance of cluster munitions from contaminated areas and is intensively engaged in provision of funds needed for the implementation of these projects. On 11 Аpril 2017, commenced the field operations under the Cluster Munitions Clearance Project of the "Sjenica -Airport" site, No. 0181/15, Municipality of Sjenica, totaling 177,120 sqm. Implementation of this project started on 30 December 2016, but the field operations were suspended due to unfavorable weather conditions. The project area covers civilian landimmediately alongside the military airport in Sjenica. Contractor is Saturniad.o.o., Belgrade, with a subcontractor Stop Mines, Pale, Republic of Srpska - Bosnia and Herzegovina, and, according to the Contractor’s Operational Plan, the works will be completed in about forty days. Project management, follow up of its implementation and quality control of the works will be performed by the Mine Action Centre of the Republic of Serbia. In the teritorry of the Republic of Serbia, cluster munitions contaminate the area of around 3,000,000 sqm, of which in the Sjenica Municipality, the area of around 1,500,00,sqm is contaminated. Since 2015, the Republic of Serbia has been allocating funds for humanitarian demining operations from its national budget, but given that these funds are not enough for solving of all the problems related to humanitarian demining, financial support from international community and donors is also required. In the period 7- 10 February 2017, in Geneva, Switzerland, the 20th International Meeting of Mine Action National Programme Directors and United Nations Advisors was held in Geneva. 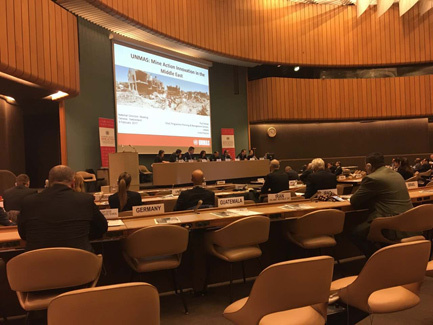 The meeting was organized by the United Nations Mine Action Service (UNMAS) and the Geneva International Centre for Humanitarian Demining (GICHD). Representatives of the mine action community had the opportunity to present the achievements and draw attention to the challenges they face, share experiences about the evolution of mine action in the last two decades, as well as to discuss issues that are directly related to their work. The Republic of Serbia ratified the Ottawa Convention on 18 September 2003, and the Convention came into force on 1 March 2004. The Republic of Serbia no longer produces antipersonnel mines, and it completed destroying its stock pile of anti-personnel mines in 2007. In accordance with Article 5 of the Convention, the Republic of Serbia is obliged to wholly clear its territory of mines up to March 2019. On January 25, 2017, at the Embassy of the Republic of Slovenia, a meeting was organized by ITF Enhancing Human Security, where Director of the Serbian Mine Action Centre, Mr Jovica Simonović, and his associates, Mr Dragiša Nikolić and Ms Slađana Košutić, met with the US Ambassador, H.E. Mr Kyle Scott and political counselor at the US Embassy, Mr John Bowermaster, Ambassador of Slovenia, H.E. Mr Vladimir Gasparič and ITF Director and Program Manager for Serbia, Mr Damjan Bergant and Mr Andrej Golob. The meeting was also attended by the representatives of the Ministry of Foreign Affairs of the Republic of Serbia, Acting Assistant Minister for Security Policy, H.E. Mr Branimir Filipović and Head of the Department of Arms Control and Military Co-Operation, Mr Milan Gojković. During the meeting, the parties exchanged view on previous cooperation in the field of humanitarian demining in the Republic of Serbia, which was estimated as good and important. 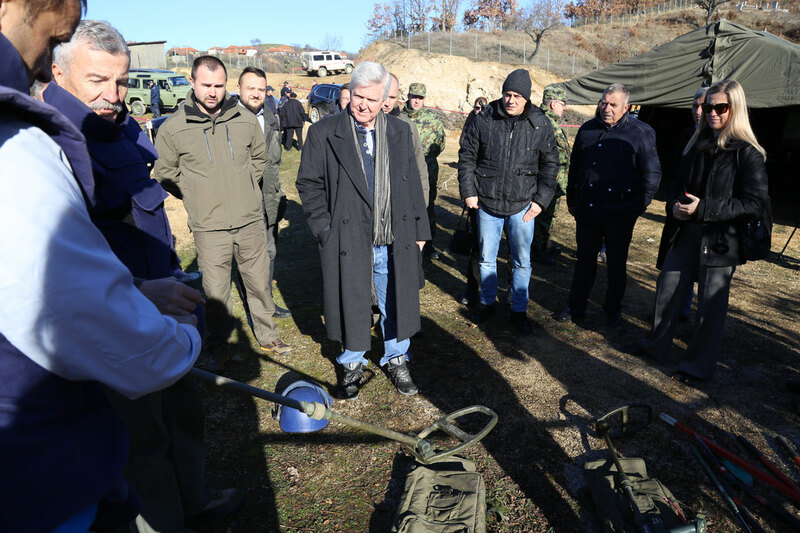 All parties agreed that there is still a need, as well as willingness to put joint efforts, in the forthcoming period, into helping the Republic of Serbia solve the problems related to remaining mines, cluster munitions and other unexploded ordnance.